Humility can be one of the most difficult traits to develop and maintain as a leader. It is also one of the most critical traits required for a leader to be effective. I struggle in this area and I know other leaders do as well. To understand humility, we need to first understand what pride is. Pride is about believing we are greater than others. It is about believing that what we have and accomplish came about because of our greatness. It is all about me. Pride is destructive. Humility is required to push pride out of our lives and keep it out. Humility is about believing that we are not greater than anyone else. We put the interests of others ahead of ourselves. We recognize that everything we have and accomplish comes from God. We are nothing without Him. It is all about God. Let’s look at the life of King Saul to get a glimpse at the battle humility and pride can have in our lives. Israel insisted they be led by a King. God selected Saul to be the first King of Israel. When Samuel was about to announce Saul as King to the tribes of Israel, Saul was hiding behind some supplies. Yes, hiding! There were many people who made it clear they did not support Saul as King. Although they didn’t hide their displeasure, King Saul chose not to respond. King Saul led the Israelites into a major battle and won. The support of the Israelites for him grew. They wanted to put to death those who opposed Saul’s reign. But King Saul said no. He also gave God credit for the win. But as King Saul became more successful, he stopped being obedient to God. He was full of pride. He also grew jealous of David who was having more success then he was. His jealousy was so strong that he was obsessed with killing David. Ultimately, it didn’t end well for King Saul and his sons. 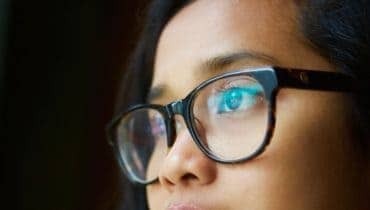 Why Is Humility Difficult For Leaders? The decline shown in King Saul’s life is not uncommon in leaders. It is easy for us to allow pride to replace humility as we become accomplished. People appreciate leaders who put others first and don’t take credit for their accomplishments. But as that appreciation from others grows, there is a danger that we will start taking credit for the accomplishments and stop depending on God. That is pride. Pride will lead to destruction. As leaders, we need to intentionally and continually seek humility to avoid pride seeping into our lives. In addition to being an antidote for pride, there are more benefits we can receive from pursuing humility. Wisdom comes with humility. Wisdom makes us better leaders. It shows us our next steps. It also helps us encourage those we lead in what they need to do next. Don’t try to be a leader without wisdom. That is dangerous. Seek humility to get wisdom. God shows favor to those who are humble even though we don’t deserve it. Where would you like to be? In opposition with God or favored by God? This is easy to answer. Seek humility to receive favor from God. True humility, as Jesus demonstrated, is an effective leader trait. People are drawn to leaders who are humble. More people to lead means an increase in the influence a leader can have. Seek humility to increase in influence. Humility can be difficult for leaders to maintain. It goes against many of the traditional leadership methods. There is pride all around us and our human nature wants to embrace pride. But pursuing humility is worth anything it costs. Ultimately, pride leads you to destruction while humility allows you to thrive. 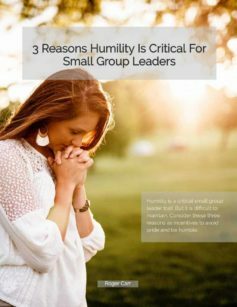 Question: What are some ways pride and humility can impact your small group? What did you do when you experienced a struggle between humility and pride in the past? You can leave a comment by clicking here. 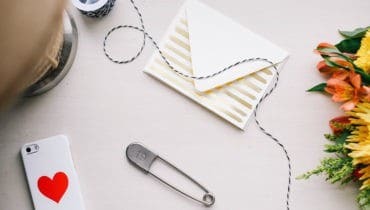 Having Difficulty Motivating Your Small Group Members? I appreciate, so much, this article! It was good hearing about the benefits of humility. I struggle to share my humility with others, at times. When I express myself as humble, I find that some people use that as an opportunity to show that they are the “expert” or that they can “teach” me. Then it causes me not to want to express my humility. I know that I need to be humble, and let others know that I am humble, but it can be hard for me. Just thinking aloud here.